If you like mint chocolate chip (Hudsonville) ice cream as much as I do then you’re going to love this smoothie recipe. 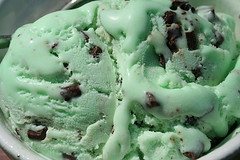 Mint chocolate chip ice cream is one of those foods I had a hard time giving up after I got serious about eating healthier. Let’s just say I was pleasantly surprised to learn that you can create a healthy version of an otherwise unhealthy food in many cases, and sometimes the healthy version actually tastes better than its counterpart. I found this to be true of this smoothie recipe once I perfected it. This is one of my favorite smoothies not only because of the great taste, but because it keeps me satiated for hours. This smoothie has it all: protein, good fat from the avocado, and superfood nutrition from the cacao. I prefer to use raw milk for this recipe, but almond and coconut will do just fine. Note, you may want to add the cacao nibs at the end if you like larger chocolate chips. Enjoy! Please leave a comment below if you try this mint chocolate chip smoothie, or have a variation of your own to share. Happy Blending! Wife wouldn’t believe me that we could use real mint leaves to make ice cream. I’m betting we’ll make her a believer. Can’t wait to give this a go when my Blendtec finally gets here. Hi Ryley, that’s funny about your wife, although I probably would have thought the same thing several years ago. I actually have 3 small jars of dried mint leaves (apple, Moroccan, can’t think of the other off hand) from this past summer. I’m not sure what I like better, the taste they lend to my smoothie or taking a huge whiff of minty menthol every time I open a jar :) Enjoy your minty ice cream and new Blendtec! Cheers! I’m new to smoothie making and really enjoying getting started with it using your website! Quick question on this one, I love mint chocolate chip ice cream so I can’t wait to try this! I don’t have any chocolate protein powder and reluctant to invest in some, would it work to just use cacao powder in place of this? Welcome aboard the healthy smoothie train, Jenny :) Yes, you can substitute cacao powder for the chocolate protein powder. Enjoy!